G-Prep’s Bishop Sankey pretty much does what he wants on the field. Bishop Sankey runs into the record books. It's an inauspicious setting to set a record. At opening kickoff at Joe Albi Stadium, the home team’s student section (Mead), celebrating Senior Night, looks anemic. The visiting team’s side is even worse. 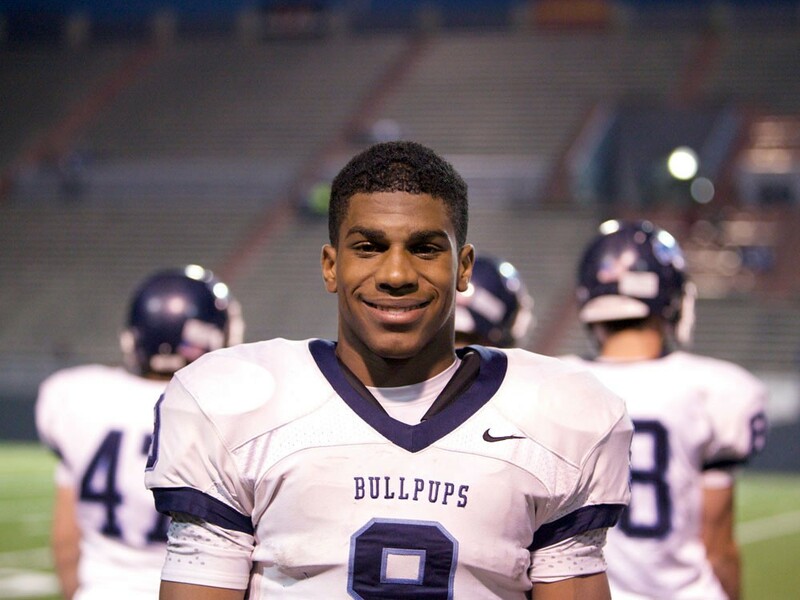 Besides the actual game itself, the running subplot involves Gonzaga Prep’s standout running back Bishop Sankey, who entered the game with 3,782 career rushing yards, 155 behind the all-time Greater Spokane League record of 3,937. One could safely assume that Sankey, averaging 253 yards per game, would be able to surpass it. Sankey runs it up the middle following a G-Prep interception on the first play of the game, spins to avoid a defender, keeps churning, breaks free and sprints down the field for a 56-yard touchdown. It’s pretty clear to everyone — people in the stands, his coaches on the sidelines, the other team’s defense — that the best way for G-Prep to win is to put the ball in his hands. Even if you know what’s coming (and since Sankey had 41 carries en route to 359 yards, it wasn’t exactly a secret), it’s still really hard to bring him down. Sankey’s picked up gains of four yards here, six yards there, in between giving the ball to other backs a few times and G-Prep airing it out. His second TD comes after he runs right, head-fakes and dips in and out of the defense before finding the goal line. It’s difficult to ascertain at first glance what exactly makes Sankey such a great runner. He’s fast, but not the fastest; he’s not particularly tall, at 5-foot-9, but he’s solidly built. Really, it’s a combination of things. Sankey keeps whittling down the magic number: pounding it up the middle for 12 yards; dragging a player who’s caught his jersey for five yards before going down. Then, needing 7 yards to break the record, he sees a hole and dives through for an 8-yard gain. The record is announced over the PA system, and the fans give him a standing ovation. McKenna calls a timeout to talk things over. “I just wanted to congratulate him and tell him it was a huge achievement, but it wasn’t about him — it was about his teammates as well. He understood that, and wanted to get the W,” McKenna says. Sankey proves it by going out and scoring his third TD of the game on the next play. He got the next two yards, the score and another 201 yards, to boot. G-Prep won the game, and a spot in the playoffs, 35-21. Even though Sankey’s on the verge of setting more marks, for most rushing yards in a single season at the GSL and state levels, he says he’s focused on something else: next week’s game against Ferris, ranked No. 4 in the state (G-Prep is No. 6).